It is a strange couple of words...empty nest. It is so often used for couples whose children have "left the nest". What I have always found in the bird world, though, is that the Momma and/or Pappa bird is exactly trying to do that with their little ones. They do feed them and grow them strong, but with the purpose that they can thrive on their own and fly. So, that is the opportunity we have given our children for two weeks. They must fly on their own. They have been in a camp in Switzerland, while I returned to Atyrau to be with my husband. It has been a strange mix of emotions for me. I have had my son take school trips before, but never the both of them at the same time. It was hard to see them going to the different stations to check in for the first day of camp...they had the registration desk, the bank, the health desk, the French language desk for our son and the activities desk for our daughter. They seemed so strong and capable, which made me feel very proud. My daughter got her room assigned, and with a kiss and hug, up the elevator she went to unpack and settle in. My son took a little longer because he had an on-the-spot French chat to gauge where they would place him. He is always the one to sort of shoo me out the door though. Once his room was assigned he waved and said see ya! Then there I was...on my own. without my two little ones needing me. 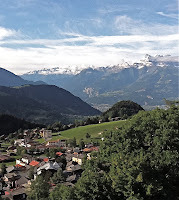 I spent the night in a hotel close by and kept checking out on the balcony, hoping to see a sort of "Sound of Music" group of children, that of course would include my own, traipsing through the beautiful hills that surround this area of Switzerland. The next day I arose, and still no sounds of any children..and weighing heavy on my heart, all the children lost to the maniac in Oslo, Norway. The trip home started well, got to Istanbul, spent the evening in the hotel and was on my way the next morning to be with my husband...er, wait a minute...there I was, of course paying for my overweight baggage, when the phone rings. Now I normally would not have answered it, except that I looked at the number displayed for some reason, and noticed the country code was Switzerland! Uh-oh...did I make a mistake? Did someone get hurt? No, it was just my daughter, missing me. It was hard to be strong for her because I missed her just as much. I wanted, in a way, to run to her and hold her. But I knew she would be fine as the days wore on, and that she would have fun. My husband and I hope that she, and our son, grow from this experience of being away. That is our job...to get them ready to fly out of the nest. Oh, and my empty nesting home? It has been a wonderful week and I only expect it to get better. I marvel at how my husband and I have overcome many things in our lives, and we still find the magic that binds us together. You are such a deeply thoughtful and insightful parent. I wish all children could be so lucky. Enjoy your time in London, your reunion with your kids, and the rest of your travel plans! So poignantly expressed. I was reminded of dropping my son off at NYU in lower Manhattan. His mother and I said goodbye to him as we left a coffee house. We were heading to the airport, he, to a new world waiting. And I remember how my heart seemed to sink as we watched him disappear down the crowded sidewalk without even once looking back. And I was happy for the same reason. He was ready to fly. I´m sure when they really do leave the nest for good you will be prepared for it. Good for you, for letting them experience and grow into the freedom of being on their own. Hugs and Much love to you, BG! !